This month my assignment was Corey’s blog, at Learning Patience. I love the yummy variety of things on her blog. SO many tasty things, like Grilled Fennel Crusted Pork Chops, Grilled Romaine Salad with Shrimp, Mexican Sweet Potato Fries, Wonton Mini Nacho Bowls, 7 Vegetable Quinoa Soup, Bruschetta with Shrimp, Tarragon and Arugula and Crunchy Chocolate Chip Coconut Macadamia Nut Cookies. 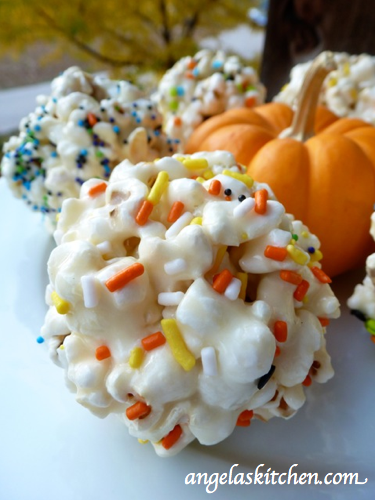 It was a tough call, but last month with Halloween looming and days of leaf raking ahead, there was no question in my mind which recipe I needed to make: Marshmallow Popcorn Balls. Yum! These fun treats were really fun to make, easy and delicious. I added some seasonal sprinkles to add to the fun. I can’t wait to make these with other seasonal sprinkles for upcoming holiday treat platters. 🙂 Thanks for the great recipe, Corey! 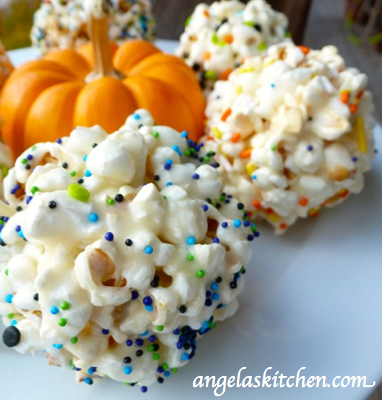 The recipe I have included is the basic popcorn ball. Add up to 3 cups mix-in options when adding the popcorn to the melted marshmallow for different varieties. Up to 3 cups of mix-in ingredients, optional: nuts, dried cranberries, chopped apricots, etc. In a large bowl, combine the popcorn and any mix-in's. Set aside. In a large pot, combine marshmallows, margarine or coconut oil, and salt. Cook marshmallow stirring very often over medium-low heat until melted. Pour hot marshmallow mixture over popcorn mixture, and mix well. When cool enough to handle, oil hands and shape mixture into balls. When shaped, decorate with sprinkles and place in a lightly oiled muffin tin to hold shape. To store, wrap each popcorn ball in plastic when cooled. I haven't had popcorn balls in ages! What a great pick. And they look so yummy and festive. I bet my daughter would love to make these for her classmates! Great choice for SRC! Boy, would my kids ever love these! 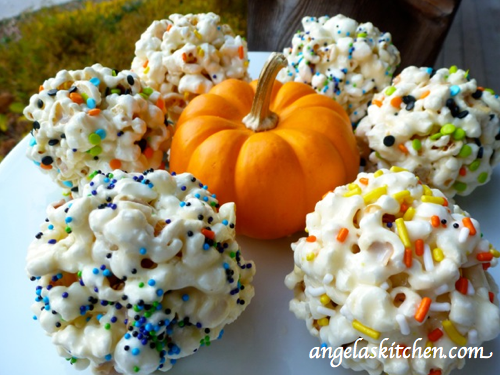 Can you believe I've never made them popcorn balls??? I can't. Thanks for the inspiration to make some! Fun treat. 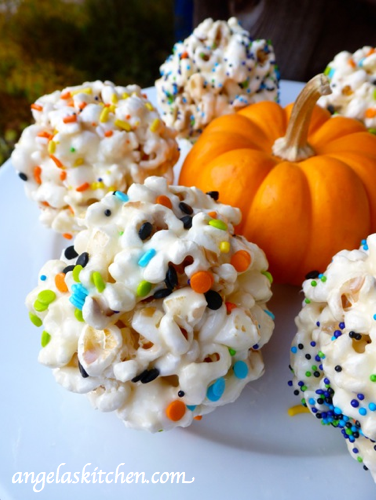 These popcorn balls look like such fun!